Present state: Despite its earth, clinker and timber construction the platform and 'waiting room' are largely intact although the platform is now somewhat overgrown. Notes: After a local campaign the residents of Ashdon were given a new halt which opened on the up side of the Audley End – Bartlow line on 14 August 1911. The platform was constructed of raised earth and clinker with sleeper frontage to the track and sleeper edging. An old GER carriage body was mounted on the platform in 1916 to act as the waiting room. The carriage was stripped internally and wooden benches fitted to the sides. The Fallowden Lane level crossing at the north end of the halt was the only level crossing on the branch. 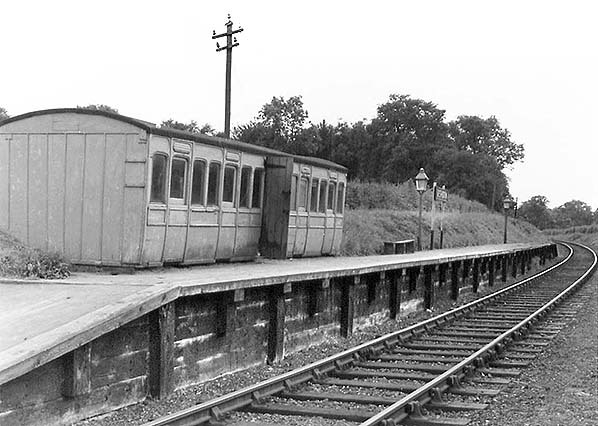 Unlike on, for example, the Mildenhall and Thaxted branches where conductor-guard trains were in operation, the ticket system for Ashdon Halt was rather peculiar, although not unique. Passengers travelling to the halt purchased tickets in the normal manner at their station of departure. 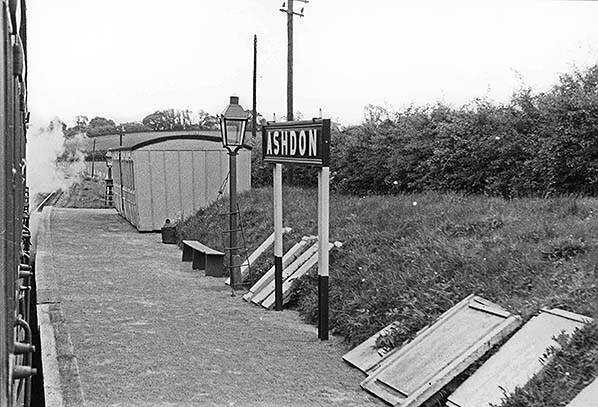 Passengers travelling from Ashdon, if not in possession of a return ticket, boarded the train without a ticket as the halt was always unstaffed. The guard would then make a note of how many passengers boarded and those passengers were required to purchase their tickets at Bartlow, Audley End or Saffron Walden. Thus the strange situation existed whereby tickets from one station, or halt in this case, were issued at another station retrospectively. Tickets sold then had to tally, or were supposed to tally, with the figures supplied by the guard. 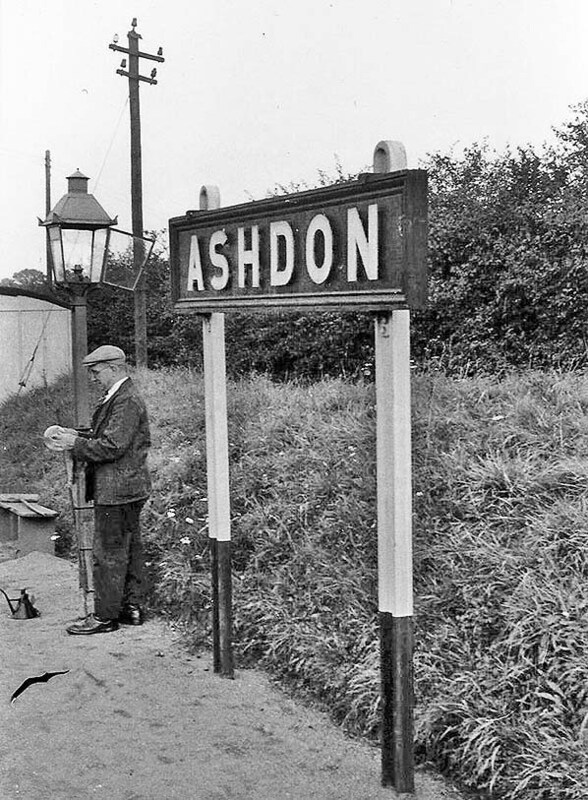 As passengers boarding at Ashdon may not all alight at the same station, presumably the tallying-up was ultimately done by the accountants. With the exception of through journeys to Haverhill, passengers boarding at Ashdon who wished to travel beyond the Saffron Walden branch were required to rebook at Bartlow or Audley End as appropriate. Thus in the case of ticket No.2495, Ashdon Halt - Liverpool Street, the passenger would travel ticketless from Ashdon to Audley End and at the latter purchase a ticket covering the entire journey. This was not as cumbersome as it may seem as passengers changing trains at Audley End or Bartlow had to pass through the booking hall to reach the main line platforms. The same procedure is thought to have applied to passengers boarding at Acrow Halt, for which standard Edmondson tickets were also issued. The system must have relied heavily upon the honesty of the travelling public, although there was an office on Audley End branch platform and there is some evidence that a member of staff, presumably a porter, met branch trains at Bartlow. The situation with excursion trains calling at Ashdon is unclear, GER ticket No.0046 being an example of just such an excursion. This train, to Southend, would have operated via Audley End and probably Coppermill Junction but where it commenced is not known. Logic says Cambridge and it ran via Bartlow, but we do not know. Excursion tickets from Ashdon would presumably have been purchased in advance from either Bartlow, Saffron Walden or even Cambridge. Alternatively there may have been a railway agent in Ashdon village: such agencies were once common, but, again, we just do not know. With the exception of Audley End - Haverhill through services, Bartlow saw no regular trains on Sundays and thus was unstaffed. It was for this reason that Sunday Audley End - Haverhill services, of which there were only two, did not call at Ashdon Halt. Some sources say that these services did not call at Bartlow either, but working timetables and photographic evidence shows they did. In view of this, passengers boarding at Bartlow on Sundays would also be required to follow the 'pay at your destination' procedure. Today there are still instances where passengers are required to pay at their destination but board with a 'Permit to Travel' issued, usually, by a machine. The railways always have - and always will - have problems with fare dodgers but since rail 'privatisation' by which a percentage of profits end up in the coffers of some foreign government or railway operator, all passengers are now treated with suspicion, and the days of applying a degree of trust, such as was the case at Ashdon, have long gone. BRIEF HISTORY OF THE SAFFRON WALDEN RAILWAY In 1835 Saffron Walden was surveyed as part of the London to Cambridge railway line and hopes for its future prosperity were raised. Unfortunately the intervention of Lord Braybrooke made the siting of a station in Saffron Walden impossible and a new station was constructed two miles from the town at Audley End. It was soon apparent to the town council that they needed a railway connection to arrest the economic depression which had descended on the town. A public meeting was held in 1860 and a proposal was put to the Eastern Counties Railway for a branch from Audley End to Saffron Walden. Sufficient local finance was soon forthcoming and a bill was put before parliament on 14th November 1860 with the Saffron Walden Railway Act receiving Royal Assent on 22nd July 1861. From the outset the line was beset with problems, passenger numbers were disappointing, not helped when the state of the track required a 10 mph speed limit to be introduced. To avoid insolvency the Saffron Walden Railway Company eventually sold out to the Great Eastern on 1st January 1877. The new ownership brought changes with a through service to London being introduced in an attempt to increase passenger revenue, Goods traffic handled at Saffron Walden yards was increasing steadily each year. WW1 brought added prosperity; although the line was now under government control, the prewar passenger timetable was retained and goods traffic flourished as home grown produce was dispatched to towns and cities to make up for the loss of imported food. The countryside around Saffron Walden was also used for troop training which brought added traffic to the branch. After the war the 1919 General Railway Strike led to a decline in railway freight with local farmers turning to improving road transport. Passenger numbers remained healthy however as few local people owned cars. On 1st January 1923 the GER was absorbed into the London & North Eastern Railway. Initially there were few changes but a railway strike in 1924 brought a decline in use of the branch with passengers turning to road transport. The 1926 General Strike brought a further decline in freight traffic from which the branch was never to recover. Passenger receipts began to pick up in the mid 1930's when holidays and rambles in the country became popular. Shortly after the start of WW2 the branch began carrying evacuees from London and with petrol rationing curtailing road transport the line began to prosper with most trains running full. After the war the service began to deteriorate with freight traffic back in decline following the lifting of petrol rationing. By the early 1950's the increase in car ownership led to a dramatic loss in passenger revenue but as several of the surrounding lines closed the Saffron Walden branch survived and as part of the 1955 BR modernisation plan diesel rail buses were introduced on 7th July 1958. Despite their success the line was listed for closure in the 1963 Beeching Report and despite a spirited local attempt to keep the line open the passenger service was withdrawn from 7th September 1964. 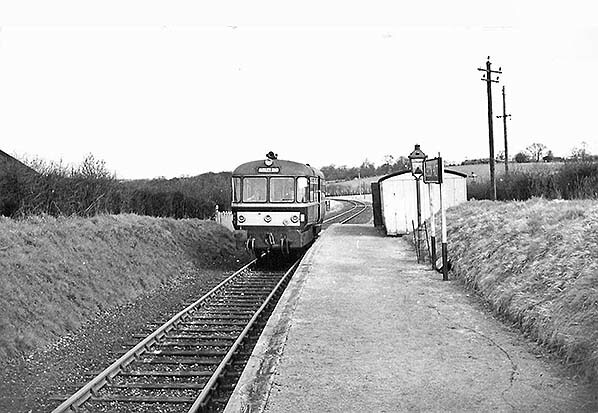 Within a month of closure, BR announced their intention to withdraw freight facilities from 28th December 1964. 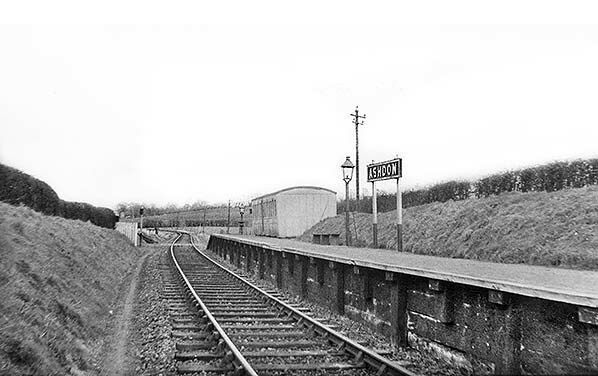 The junction at Audley End was severed by June 1965 and the majority of the track was lifted during the summer of 1968. A short section at Bartlow was retained and this was used during the making of the film 'Virgin Soldiers'. 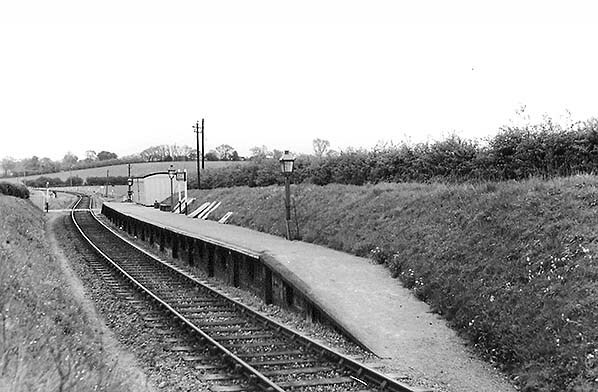 The last section of track was finally removed when the Stour Valley line was lifted in 1970. 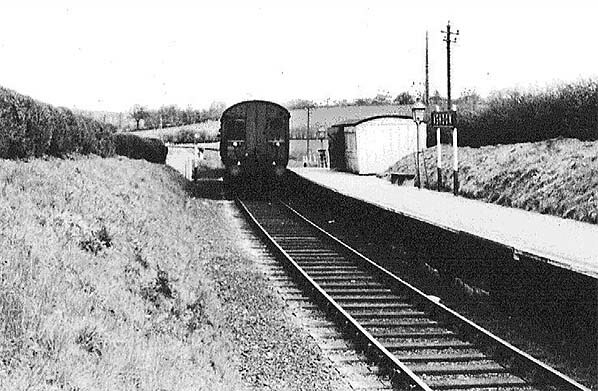 Ashdon Halt seen from track level in March 1955. Strangely, views such as this one looking towards Bartlow are common yet views in the Audley End direction, taken when the line was still open, are much less common. The rolling nature of the countryside in this area is apparent, as seen at Ashdon Halt which is situated in a shallow cutting. Immediately beyond the far end of the platform is Fallowden Lane level crossing, the only public level crossing on the branch. Fallowden Lane and the halt itself were actually located in Church End, Ashdon-proper being approximately one mile away. In the distance, just beyond the evidence of human life and where the track curves to the left, is Wiseman's occupation crossing - the scene of at least one fatality during the line's existence. Despite the nameboard being in apparently good condition, the Saffron Walden branch was to receive the British Railways’ Eastern Region signage a year or so after this photograph was taken, although Ashdon was never to receive totems. Two oil lamps are visible; it is thought that three were originally provided but the third, at the Saffron Walden end of the platform, fell out of use and was removed at an early date. Lighting and extinguishing the lamps was the job of train guards, and steps or a ladder were provided at each lamp as it would have made guards’ work quicker and easier, rather than having to carry steps or a ladder between lamps. For this reason a ladder is leaning against the nearest lantern. A little-known aspect of the guard’s job was the requirement to sign-on for duty and acquire the means - usually vestas (matches) supplied by the railway - of lighting the lamps. A rudimentary bench seat is provided between nearest lamp and carriage body. The door of the carriage-body waiting room is shut on this occasion; many photographs show it as being left open. 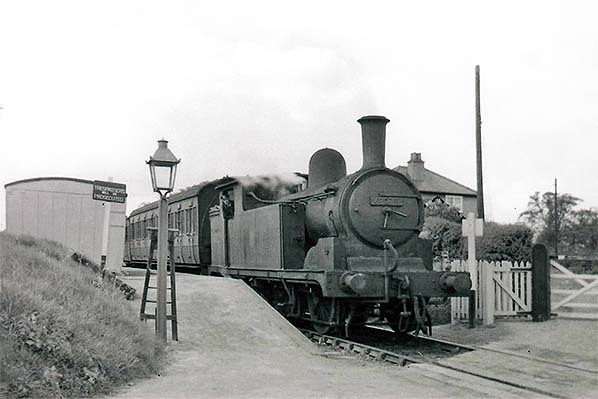 Class G5 0-4-4T No.67279 has propelled into Ashdon Halt in 1956 with a Bartlow - Audley End service as the fireman looks out of the cab. The other two G5s at Cambridge for use on the branch were numbers 67269 and 67322, having previously been allocated to Stratford. Ashdon Halt looks neat and tidy. Maintenance of the oil lamps is ongoing and Fallowden Lane level crossing, the only public level crossing on the branch, is in the foreground. The 'Trespassers will be Prosecuted' sign is rather oddly placed and suggests that passengers may not proceed beyond the top of the platform ramp. No doubt the relevant railway bylaw added, in a long-winded way, words to the effect that people intending to board a train, or alight from a train, were excluded by virtue of being on legitimate railway business. Nevertheless, one wonders how many people saw the sign and hesitated. Oil lamp cleaning and maintenance in progress at Ashdon in 1956. The lamp itself is still inside the casement and the gentleman is cleaning the lamp chimney. These chimneys were shaped rather like an elongated onion, with a bulbous bottom end which surrounded the flame and tapered off to form a tall, narrower, chimney. The design was connected with air flow through the lamp and which, providing the wick was set correctly, created a reasonably clean-burning flame. If the wick was set too high, combustion would be inefficient, resulting in black and sooty smoke. Precisely who was responsible for maintaining these lamps at this small, unstaffed halt is not clear but it was probably the foreman or chargehand of the permanent way gang. Whoever the gentleman seen above was, he appears to have been quite content in his work. 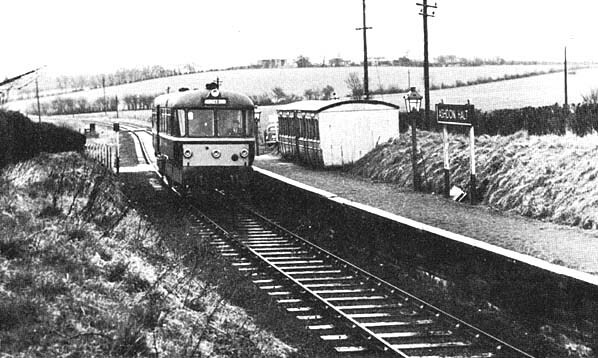 Looking towards Bartlow, this is Ashdon Halt sometime before the it was catapulted into the space age by being given a BR Eastern Region running-in board. Undated photographs such as this can often be pinned down to a certain period by examining coincidental features such as road vehicles. The car just visible at the crossing appears to be a Ford Model Y and this car was in production from 1932 to 1937, so is of little help in dating this photograph other than by telling us it is 1930s or later. It is almost certainly mid 1950s; most photographs of Ashdon Halt date from this period and from railbus days; pre-1950s photographs of the halt appear to be extremely rare. Fallowden Lane level crossing can be seen beyond the platform with Wiseman's occupation crossing in the distance. Ashdon Halt seen from a push-and-pull train in May 1956, but in which direction the train was travelling is not recorded. The push-and-pull trains always worked with the locomotive at the Bartlow End. The GER running-in board looks very smart and had probably been repainted as part of the ongoing work. Despite its pristine condition it would soon be replaced by an Eastern Region blue example. This view is little different from numerous others but is included as it shows the full length of the 210ft platform. The date is given loosely as 1950s but the giveaway is the items lying on the bank behind the platform. Some repair work is known to have been undertaken in May 1956 and appears to be what is in progress above. Although the angle is not ideal, the door of the carriage body appears to be missing in this view. This was a replacement for the original door to what had been the central compartment. Both ladders for maintaining the oil lamps are visible; one is nearest the camera and the other at the far end of the platform. That at the far end can also been seen in the 1956 view of the G5. Another item sits on the platform between the second lamp and the carriage body. It appears to be a gas cylinder but is too far away to confirm. Ashdon Halt looking south-west towards Saffron Walden and probably one of the numerous photographs of the halt taken in the early to mid 1950s. The history of the carriage body is well known; it began life in 1883 as GER No.342, was withdrawn in 1915 and the body was placed at Ashdon the following year. It was a 5-compartment 6-wheeled all-second vehicle. What is less well known is that it was one of several which the GER widened from the original 8ft to 9ft. This work was undertaken around the turn of the century to enable the compartments to seat six passengers on each side. History states that the widening was done by cutting the bodies in half lengthways and inserting a 1ft wide section. However, examination of the body at Ashdon suggests that the widening was disproportionate, perhaps to a 60:40 ratio above and below the waistline. This, it must be stressed, is an unconfirmed observation and should not be taken as being factual. Doorways on these Victorian suburban carriages were quite narrow and this may have been the reason why one, at Ashdon, was replaced with an apparently wider 'shed door' type to form the entrance. However,examination of the body in its later dilapidated form shows that no alterations were made to the door aperture. We can therefore assume that the 'shed door' was fitted to the exterior of the body rather than within the door aperture. This appears to be confirmed, above, by the position of the hinges and would explain why the 'shed door' was apparently wider than the original. The above view shows that the droplights of the remaining, but sealed-up, doors were still present as was at least some of the glass. A push-and-pull set arrives at Ashdon Halt from Bartlow. The train will be powered by an N7 0-6-2T as the stock is one of the Gresley sets which arrived on the branch with the N7s in October 1956 and lasted until July 1958; the photograph therefore dates from this short period. The running-in board was yet to be replaced with an Eastern Region blue example. Photographs showing the driving trailer cab end of these sets are not especially common in comparison to their predecessors which spent five years on the branch. Both types had come from the Palace Gates branch. Being 2-car sets they had adequate passenger accommodation and a large brake compartment, unlike the railbuses with 56 seats and just a small luggage pen adjacent to the entrance vestibule on each side. On its way to Audley End, a diesel railbus shatters the peace of Ashdon Halt in April 1963. This is E79963, recognisable by the small yellow warning panel and offside warning flash further round on the body side. It would later receive a single warning flash at the top of the offside windscreen at each end. In 2015, almost half a century after E79963 was withdrawn by BR, she continues to do what she was designed to do and has visited a number of heritage railways in recent years. 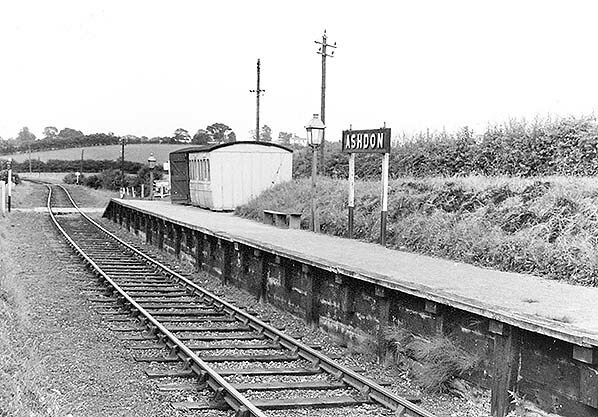 Back at Ashdon in 1963, the halt had by then been given an Eastern Region running-in board, including the ‘Halt’ suffix which its predecessor did not. The oil lamp appears to have a larger fount (tank), suggesting that it was of the long-burning type. These were once common and the LNER had a particular fondness for them, the advantage being that they needed filling with paraffin less often. However, this was really only an advantage with signal lamps and less so at halts such as Ashdon where they had to be lit and extinguished daily, regardless. The door of the carriage body is open; this does not necessarily imply a rush of passengers as photographic evidence suggests it often was left open. This view illustrates the rolling nature of the countryside in this area. The Saffron Walden - Bartlow section was quite sinuous as a result and included the notorious 1:75 Ashdon Bank which climbed for 1½ miles from the outskirts of Saffron Walden towards Ashdon. A diesel railbus for Audley End is seen at Ashdon Halt on a wet day in May 1963. Photographs of genuine passengers, as opposed to bystanders with cameras, at Ashdon at extremely rare. That said, it is logical to assume that many photographs would be taken at weekends when people were not at work. If the above photograph was taken on a Sunday the railbus, which in this case is E79964, may have come from Haverhill, and these services did not stop at Ashdon. Once the railbuses gained yellow warning panels and overhead warning flashes they became easy to identify if the number was not visible, as in this instance. E79961/2/4 had deeper warning panels but that on E79964 was not quite as deep as on the other two. Numerous photographs exist of railbuses on the Saffron Walden branch but for some mysterious reason E79964 was the least photographed.